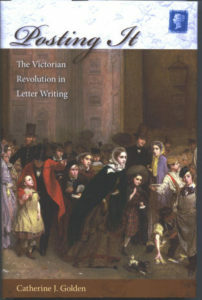 Catherine J. Golden’s delightful book, Posting It: The Victorian Revolution in Letter Writing, (University Press of Florida, 2009) has been re-released in paperback. Approaching postal history from literary and material culture perspectives, she examines the impact of cheap postage in Great Britain following the 1840 introduction of postage stamps. The transition of mail from a luxury only the rich could afford, to an everyday feature of Victorian life, which allowed “anyone, from any social class, to send a letter anywhere in the country for only a penny had multiple and profound cultural impacts.” In the second section of her book, “Outcomes,” Catherine examines the rise of postal related consumer goods such as illustrated envelopes and writing desks; the less desirable results of cheap postage ranging from a flood of unwanted mail to postal blackmail; and finally Valentines as a window on Victorian courtship and love. Her book received the 2010 DeLong Book History Prize for the best book on any aspect of the creation, dissemination, or uses of script or print from SHARP, the Society for the History of Authorship, Reading and Publishing. Catherine is a scholar of the Victorian era and professor of English at Skidmore College. She presented papers, “Why is a Raven like a Writing Desk?” and “You Need to Get Your Head Examined: An Analysis of the Unchanging Portrait of Queen Victoria on Nineteenth-Century British Postage Stamps” at the last two Postal History Symposia. 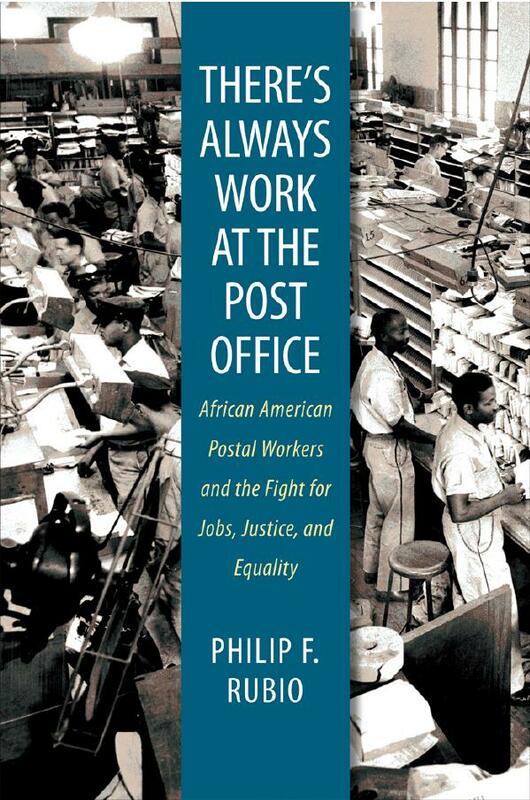 For a parallel look at the American response to cheap postage following the 1851 rate reduction and reforms, read David M. Henkin’s The Postal Age (University of Chicago, 2006). As we near the holiday season, you may find yourself wanting to purchase a gift for a child, grandchild, or other youngster to encourage a budding collector or just plant a seed that might blossom in the future. One possibility is the book, Wild About Mammals, by Cody Lee. Her lifelong interest in animals took a new turn when she inherited a large international stamp collection. 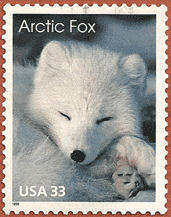 The book, completely illustrated with stamps, provides basic information about more than 160 mammals. For collectors, the appendix gives the Scott Catalogue numbers for each stamp in the book. The book was published as a print-on-demand title and is available from AuthorHouse. During the Civil War, stationery printers in the North and South produced at least fifteen thousand different pro-Union and two hundred fifty different pro-Confederate patriotic envelope designs. Steven R. Boyd, a long time collector of patriotic envelopes and Professor of History at University of Texas – San Antonio, provides a fresh perspective on them in his new book, Patriotic Envelopes of the Civil War: The Iconography of Union and Confederate Covers. 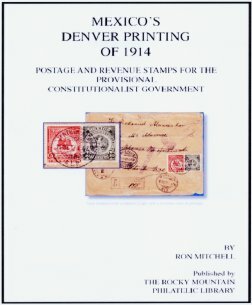 Although there is already a rich body of philatelic books and articles, Boyd has written the first book-length scholarly analysis of these patriotic envelopes and lettersheets. He explores their imagery and iconography to gain an understanding of what motivated soldiers and civilians to support a war that became far more protracted and destructive than anyone anticipated in 1861. While Northern envelopes typically argue for the importance of preserving the Union and preventing the destruction of United States, Confederate covers, in contrast, usually illustrate a competing vision of an independent republic free from the “tyranny” of the United States. These envelopes also reveal much about changing roles for women and African Americans in America due to the war. This book is another example of the growing academic awareness of stamps and covers as appropriate primary sources for scholarly study. Boyd previewed some of the material from his book at the Fifth Postal History Symposium in September. The 192-page hard bound book, with 181 color illustrations, is available from LSU Press for $36.95 plus shipping, but if you order online before the end of the year with the code 04ANNIVER you can take 35% off the list price. 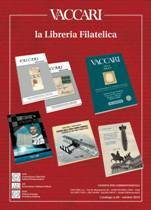 This weekend I received Vaccari’s 28th philatelic literature catalog, la Libreria Filatelica, in the mail. In addition to the sections on Italian States and the Italian Kingdom and Republic, the scope of the catalog is international with a strong European emphasis. The major sections include catalogs, dictionaries & handbooks, airmail, military, colonies & occupations, rates & regulations, revenues, thematics, postcards, and numismatics; plus a section for used and rare titles. At the back, tete-beche style, is their third catalog of general history titles, again heavily Italian and European. Not only booksellers, but also as publishers and scholars, Paulo Vaccari sets such high standards for research and printing quality in his own titles that I regret never having learned Italian. Also, for over 20 years they have published the award winning Vaccari Magazine, a semi-annual postal history journal. They continually update the electronic version of the Vaccari catalog with much of it bilingual, Italian and English. Their web site also includes press releases and a philatelic news blog in Italian. 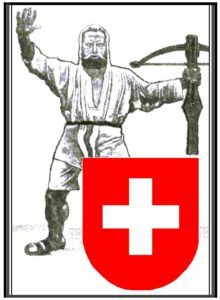 The American Helvetia Philatelic Society (AHPS) has released a wonderful introduction to Swiss philately with 32 chapters that cover the expected topics like classic cantonal issues and airmail – as well as topics like Hotel Post and Soldier Stamps that are particularly Swiss. Each attractively laid-out chapter was written by a different collector who specializes in the area, under the editorship of Richard T. Hall. If you are searching for a new collecting area, the book provides collecting tips and guidance for beginning collectors of Switzerland. At the same time, it will be an important reference work for experienced collectors. One of the valuable reference tools is the multilingual philatelic dictionary on CD. This 352-page, full color, hardbound volume with dust jacket, including the CD is $65 post-paid from the AHPS. Although the title – Smithsonian Contributions to History and Technology, No. 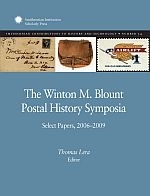 55: The Winton M. Blount Postal History Symposia: select papers, 2006-2009 – is rather ponderous and academic sounding, the latest volume from the Smithsonian Institution Scholarly Press is a lively collection of essays that examine postal history within the larger contexts of social, political, and economic history. The 16 not previously published essays, by 18 authors, were selected from over 60 papers presented at the first four Postal History Symposia: three from 2006 “What is Postal History?”; a single from 2007 “Further, Farther, Faster: Transportation Technology and the Mail”; four from 2008 “When the Mail Goes to War”; and half the volume from last year’s “Postal Reform” conference at the Match Factory in Bellefonte. Full disclosure – the final essay in volume is mine, “Cheap Postage: A Tool for Social Reform.” Considerable credit goes to Tom Lera, at the Smithsonian National Postal Museum (NPM), for orchestrating and editing this volume. The 170-page, soft bound, full color volume is available free from the Smithsonian Institution Scholarly Press – click on the Ordering Link and follow the instructions for sending an e-mail request at the bottom of the page; be sure to request “Contributions to History and Technology, No. 55.” Or, you may download the full text as a pdf file. The Postal History Symposia are an annual project of the NPM along with the American Philatelic Research Library, and the American Philatelic Society. They were conceived as a venue for bringing together philatelic and academic postal historians, allowing them to interact and share their research. One measure of success is that seven of the 18 authors in this volume are academic or public historians, who do not collect stamps. The next symposia, “Stamps and Mail: Imagery, Icons, & Propaganda” is September 30th and October 1st at the National Postal Museum.